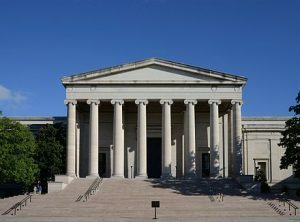 Main facade of the National Gallery of Art, Washington DC. This file is licensed under the Creative Commons Attribution-Share Alike 4.0 International license. The National Gallery of Art, Washington recently opened America Collects Eighteenth-Century French Painting, an exhibition that serves as the first survey of American taste for French 18th-century painting. It features 68 of the finest examples found in American museums today and tells the story of the collectors, curators, museum directors, and dealers responsible for bringing the paintings across the Atlantic and into the collections they now call home. The accompanying catalog features 11 essays by an esteemed group of scholars, an extensive exhibition checklist with new provenance information, and an illustrated chronology. Also, the Gallery just released a new Online Edition in conjunction with the exhibition: the NGA Online Editions series, Focus Section – French Paintings of the Eighteenth Century. The web-based Online Editions series is part of an ongoing effort to digitize and provide open access to the Gallery’s permanent collection catalogs and will eventually document more than 5,000 works of painting, sculpture, and decorative arts. Focus Section – French Paintings of the Eighteenth Century provides rich scholarly content including essays devoted to 20 paintings and their four related artists’ biographies. Like other Online Editions, this iteration provides free and open access to illustrated scholarly entries, biographies of the artists, and technical summaries. A customized reading environment: An adjustable split-screen “reader mode” allows users to view scholarly text alongside images, notes, and comparative figures or to view them in line with the text. Ease of research: The Online Editions toolbar provides pre-formatted citations for an object or biography, easy export, and quick access to archived pages. Archived versions and permanent URLs: Immediate access to PDFs of earlier versions and the assurance of permanent web addresses are a convenience to students and scholars alike. Enhanced search capabilities: An interactive search index is driven by an evolving list of terms particular to each area of the collection. The NGA Online Editions series presents the same authoritative, peer-reviewed scholarship found within the Gallery’s bound volumes but enriched with customized tools for a more dynamic research experience. 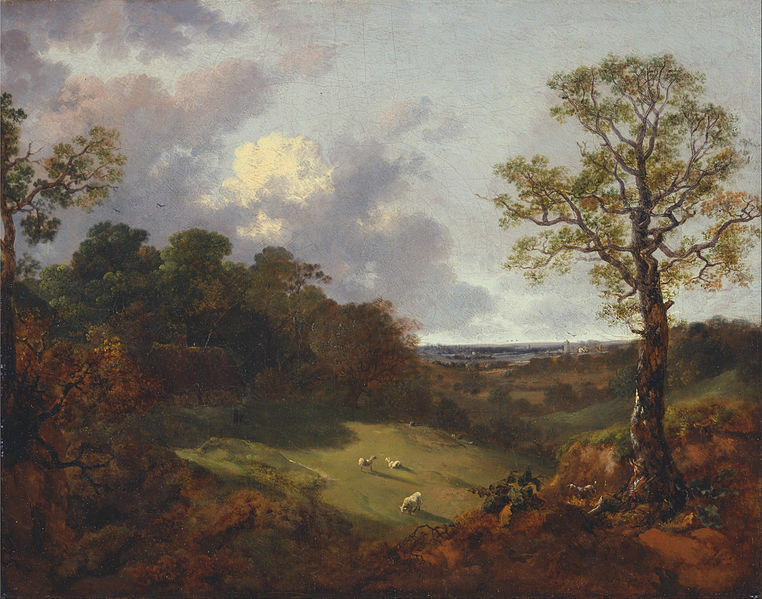 (The content of this piece was provided by Isabella Bulkeley). 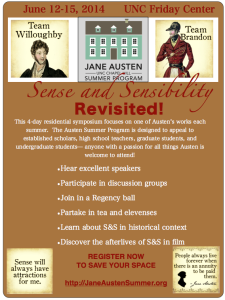 This summer more than 100 people, including Austen fans, established scholars, graduate students, K-12 teachers, and aspiring authors, will have the opportunity to hear expert speakers and participate in discussion groups on Austen’s last completed novel, Persuasion. Attendees will also partake in an English tea, dance at a Regency-style ball, attend Austen-inspired theatricals, and visit special exhibits tailored to the conference. They will be attending the fifth-annual Jane Austen Summer Program from June 15 to 18, 2017 to explore this year’s chosen theme: “200 Years of Persuasion.” The events will take place at the Hampton Inn in Carrboro, NC and at various locations on the UNC-CH campus in Chapel Hill, NC. For more program information, to see comments and photos from previous programs, or to register, please visit the program’s website janeaustensummer.org/ or follow the program on facebook.com/janeaustensummer or via Twitter, @JASPhotline. You may also contact us at [email protected]. Elementary and secondary school teachers are encouraged to visit the website for information on available scholarships and continuing education credits. June 16 to 19, 2016. Hosted by the University of North Carolina, Chapel Hill and the Jane Austen Society of North America-North Carolina. This summer, more than 100 people, including Austen fans, established scholars, graduate students, K-12 teachers, and aspiring authors, will have the opportunity to hear expert speakers and participate in discussion groups on Austen’s most controversial novel, Mansfield Park. Attendees will also partake in an English tea, dance at a Regency-style ball, join in a Regency-themed pub crawl, and visit special exhibits tailored to the conference. They will be attending the fourth-annual Jane Austen Summer Program from June 16 to 19, 2016 to explore this year’s chosen theme: “Mansfield Park & Its Afterlives.” The events will take place at the newly-constructed Hampton Inn in Carrboro and at various locations on the UNC campus in Chapel Hill, NC. “Every year we have a theatrical performance,” says Edward Davis, a veteran program participant. “It’s an original adaptation of one of Jane Austen’s minor works, performed by a group of very talented UNC grad students. It’s clever and humorous and acted in the spirit she had in mind when she wrote down her first stories. She would love our little plays. We do.” With the help of the Regency Assembly of North Carolina, the Summer Program hosts a Regency Ball at UNC’s Gerrard Hall. “The Hall dates to 1822, and the candle-lit atmosphere is perfect for bringing Austen’s plots and the Regency period back to life,” says Ruth Verbunt, who, along with her husband, has been instrumental in re-creating these historical moments. For more program information, to see comments and photos from previous programs, or to register, please visit the program’s website janeaustensummer.org or follow the program at facebook.com/janeaustensummer or via twitter, @JASPhotline. You may also contact us at [email protected]. For almost four centuries, Hingene Castle (Belgium) was the favorite summer residence of the aristocratic d’Ursel family. Each summer, the Duke, together with his family and household, would arrive to take up residence in this magnificent stately home. Today, Hingene Castle is owned by the Province of Antwerp, which has been responsible for restoring this opulent residence to its former glory. 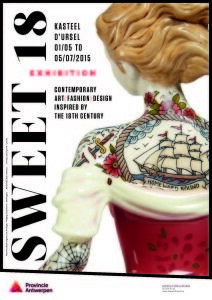 Through 5 July 2015, Hingene Castle will act as the setting for “SWEET 18,” a unique exhibition that explores the 18th century through the eyes of fifty contemporary artists and fashion designers including Erwin Olaf, Wim Delvoye, Walter van Beirendonck, Cindy Sherman, Philippe Starck, and others. “SWEET 18”: Contemporary Art, Fashion, and Design inspired by the 18th Century (Kasteel d’Ursel, Hingene, Belgium). 1 May—5 July 2015. The exhibition is open to individual visitors on Fridays, Saturdays, Sundays, and Bank Holidays, from 1 pm to 6 pm. Group visits, with afternoon tea provided, take place on weekdays between 10 am and 6 pm. Castle entrance: 8 Euros.